I had come to the Southern Sierra to join Tom Becht on his SPS list finish to Lamont Peak on Saturday. Patrick and I had gathered a day earlier to do some peakbagging in the area before Tom and a host of his friends would arrive the next day. Tom's group planned to stay at the Chimney Creek Campground off Canebrake Rd, about 4mi north of the Lamont Peak Trailhead, so I was looking for stuff we could do in the same general vicinity. I settled on a relatively tame outing, about 15mi and 3,000ft of gain to a couple of obscure summits off the PCT west of Canebrake Rd. The PCT crosses the road less than a quarter mile from the campground, so we simply left our cars at the campground and started from there. While I had spent the night camped in the van at the campground entrance, Patrick had slept in Ridgecrest and drove up to join me in the morning. Knowing the day would not be a long one, we did not plan an early start and did not get going until nearly 9a. We spent most of the first two hours hiking the PCT in a northwesterly direction, climbing almost 2,000ft in the process. The trail here is not particularly scenic, passing through BLM forest burned in several iterations over the past decade. The old Fox mill site is located about 2mi up from the TH, the structures having seen better days, reduced to rubble scattered about the foundations. Old furnaces and other stuff is scattered about as well, Patrick and I taking 5min or so to peruse the various objects and take pictures of a few of them. 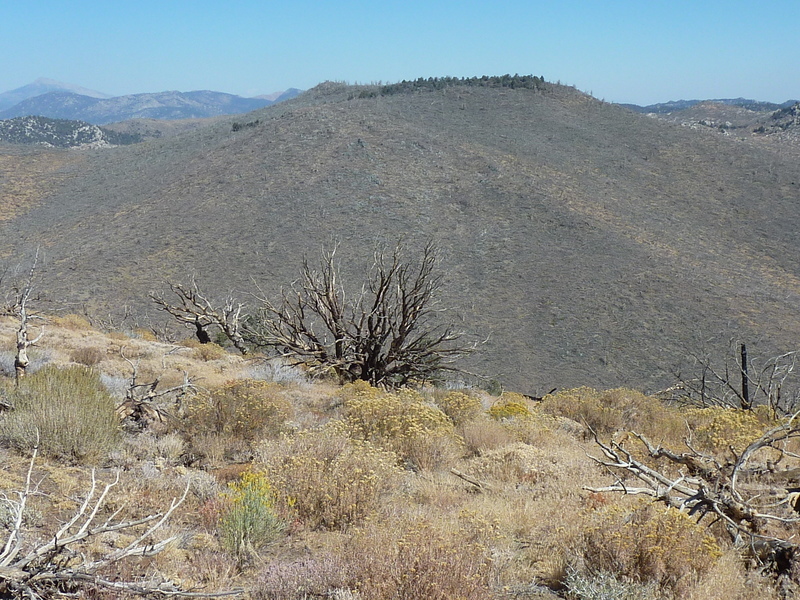 Once we were on the east side of Bear BM (Jenkins calls this Bear Mtn in her guidebook, Exploring the Southern Sierra: East Side), we turned off the PCT to follow a rough dirt road around to the south side of the mountain just below 8,000ft. From there we headed north cross-country for the final half mile. To our surprise we came across two gentlemen in a white pickup parked about half way to the top, having come up by some spur route unknown to us. They seemed just as surprised to see us. One of them was a technician who had been working on the small telecom towers near the summit. Not sure who the other guys was, but it looked like they were just hanging out and avoiding work. Can't say I blame them, mind you - it was a beautiful day out. It was 11:15a by the time we reached the top of Bear Mtn, marked by a post, the expected benchmark and no register. The views were hazy and not particularly good because of this. We paused here a while to give Patrick time to eat his lunch and some snacks while I spent time showing no particular skill in tossing rocks at the wooden post. A mile and a quarter to the north was the higher Peak 8,337ft with some 750ft of prominence, our next stop. After Patrick had finished, we continued northwest along the ridge, soon dropping down to a road which we followed for about a mile until we were on the southwest side of the second peak. A gate and fence here marked the boundary between the BLM lands we'd been traveling through and private property that abounds around the Kennedy Meadows area. It wasn't clear whether our peak was on public or private land, but it didn't seem to matter much as there appears to be little traffic in this area. We found the west and south slopes on Peak 8,337ft to be moderately brushy. Fire had destroyed most the trees that once populated the hills here, leaving a maze of some ugly buckthorn-type of brush to find our way through. Higher up we found some remnants of the forest not wholly destroyed that offered easier travel, and we readily took advantage of it. We found the highpoint at the east end of a large, flattish summit area, neither scenic nor memorable. Large trees, burned by fire, had crashed to the ground in the vicinity, offering a somewhat bleak appearance to the highpoint. We roughly followed the same route for about half the distance descending the peak before dropping south down a broad, less-brushy gully to intersect a road running down Chimney Creek. This was once part of the Chimney Peak Loop, a BLM backcountry byway route, but lower down it got washed out years ago and never repaired. A gate I had found a few years earlier downstream was locked, only allowing access to local landowners. We followed this road only a short distance before climbing back up about 200ft on the south side of the drainage to intersect the PCT once again. From here it was about 4.7mi back to the TH, following the route we had used on the ascent. We were back by 3:30p with plenty of daylight remaining. We drove our vehicles into the campground where we found Laura Molnar who was also there for Tom's list finish. She had arrived a few hours earlier and had already dispersed her copious amounts of gear about three adjacent campsites to save them for the larger group that would arrive the next day. As we pulled into one of the campsites, Patrick's dashboard lit up with a low tire pressure warning - one of his rear wheels had gone flat. It wasn't a major problem since his rental car was equipped with a spare, a tire inflator and all the necessary tools. Being a Mercedes, there was also a pair of white cotton gloves to keep one's hands clean - how very German, I thought. In addition, I had a tire repair kit that could be used to fix the tire and avoid the use of the spare, if desired. Laura and I took it pretty lightly and made a few jokes, but Patrick wasn't in a mood to join us for some laughs at his expense. He was driving the rental because his Jeep was in the shop for repairs following a minor accident, and he'd already returned one rental because it smelled terribly of smoke. He'd had his fill of dealing with auto insurance bureacracy, repair facilities and rental agencies. He was hating on cars in a most general sense by this time. It didn't help that their was an awful amount of annoying flies in our dusty campground and it was not hard to imagine more pleasant alternatives to our current location. After unloading all his gear, we jacked up the car and eventually found the cause, a tiny leak that appears to have been made by a piece of metal cutting into the tread. It seemed to me that we could either attempt to use the patch kit (not always 100% reliable and it makes the hole bigger in the process), or leave it be. Once inflated, the tire should last for half a day before deflating and it wouldn't be too much trouble getting home. We could even leave the car jacked up until it was time to leave on Sunday and then inflate it before we take off. Laura was of a similar mind but Patrick had a third option which was simply to cut his losses and head home. Though we spent some time dissuading him and it even appeared we had gotten him to change his mind for about 20min, he could not let his frustration go so easily and it got the best of him in the end. Home he went.